Say goodbye to messy cables! This IO shield is a powerful expansion shield for the Bluno M3. The breakouts for digital pins range from D0 to D38, including 5 UARTS, 8 PWM pins and 8 analog pins. The IO Expansion shield uses a convenient color coded 3 pin format for signal, voltage and ground that is useful if used with a large range of devices. 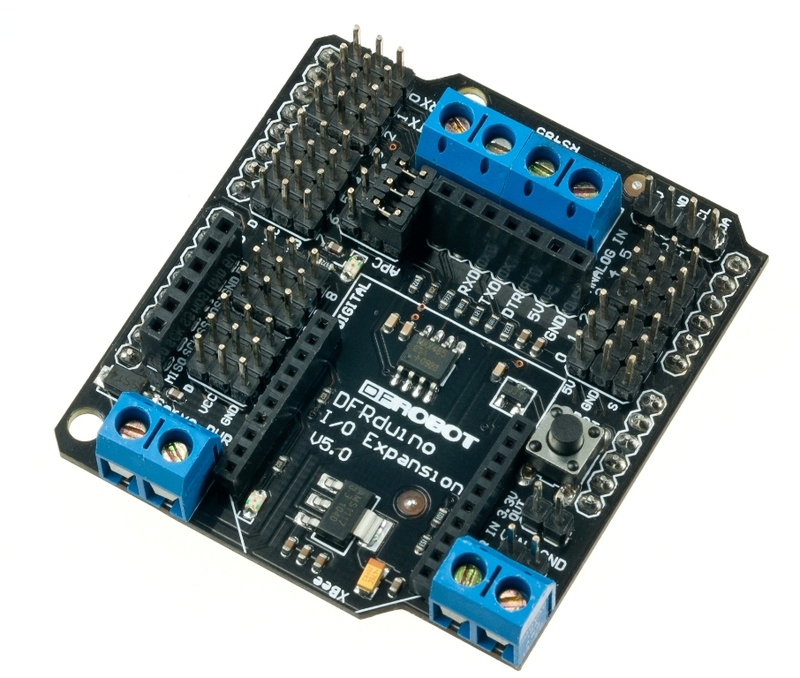 The IO expansion shield also integrates an external power connector for servos - if you need to power a large array of servos, use the screw terminals to connect your power supply and drive them directly from your Bluno M3. It will switch to the right power source automatically. An intelligent power regulator allows you to connect a battery and USB cable simultaneously, and an on-board voltage switch makes it easy to change the output voltage, making 3.3V or 5V sensors compatible. There are 17 5V-supported pins on the shield. Digital I/O pins with black background support 3.3V power input only, be careful! An on-board LED is connecting D13 digital I/O pin. The shield includes a voltage hardware setting through a switch to allow compatibility with a bigger range sensors and modules. It can change the color code VCC pins output voltage to 3.3V or 5V. Servo power port A external power connector for servos, as in other products of this family. If you need to power a large array of servos, use the screw terminals to connect your power supply and just drive it directly from your M3 Servo power port is only connecting to the color-code pin headers, it won’t power the MCU. 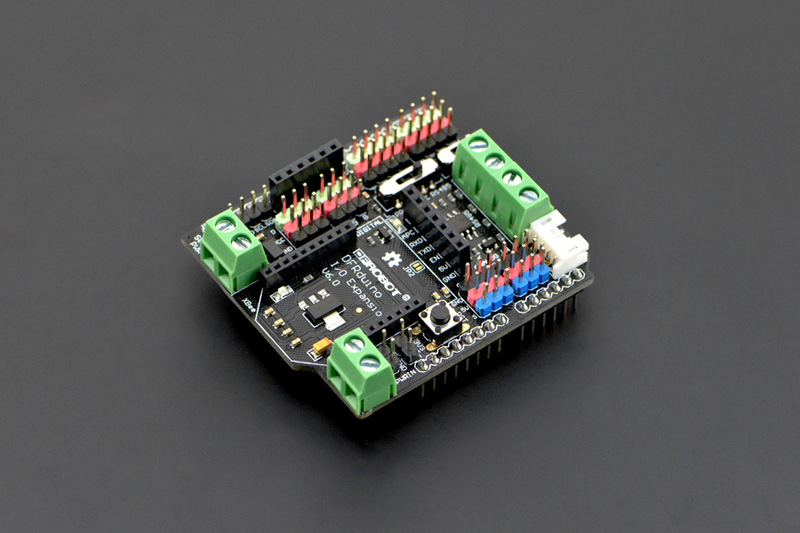 When you power the board with USB or external power port, and if you connect a power resource (>5V) to the servo power port, color-code VCC pin headers will get power from Servo power port automatically. There are no questions about this product yet, if you have any problems or suggestions, you are welcome to email us or post on our forum! Thank you! 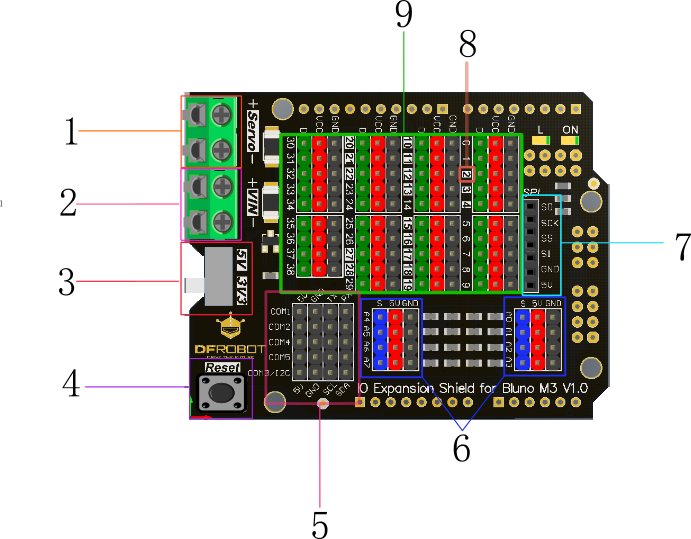 Get Gravity: IO Expansion Shield for Bluno M3 or DFRobot Distributor.